In January 2011, the Family Court decision of Wallace v Stelzer 1 brought much needed certainty to the, often convoluted, area of pre-nupital agreements also known as Binding Financial Agreements or ‘BFA’. Wallace, also known as the ‘Pole Dancing Case’, held that the 2010 amendments to the Family Law Act 1975 concerning pre-nup arrangements were valid, thus, settling a vexed issue of law. In Wallace, the applicant husband met the respondent wife at a Sydney club where the latter worked as a pole dancer. They were in a de facto relationship for seven years and eventually married in 2005. Prior to the Wallace marriage parties entered into a binding financial agreement which provided that the husband would pay the wife $3,250,000 if the marriage failed within four years. The husband had a significant employment income and other assets. The marriage broke down within two years. In mid-2007, the husband sought to set aside the agreement on the grounds that it was fatally flawed as the solicitor’s certificate annexed to the agreement was incorrect and could not be remedied. Alternatively he claimed that the agreement should alternatively be set aside on the basis that the wife fraudulently induced him to execute the financial agreement. In 2004, the federal government introduced changes to s 90G of the Family Law Act. The changes required solicitors to certify they had taken certain steps to ensure their clients understood their agreements. In 2008, the Federal Court in Black v Black held that for an agreement to be binding there needed to be strict compliance with s 90G. This gave way to a rash of litigation with people attempting to avoid their obligations on the basis their lawyers had not followed those steps. The potential effect of these amendments was that the Agreement may be held to be valid despite the fact that the certificate annexed to the Agreement was incorrect. The husband claimed that the amendments should not apply to his case retrospectively as this was unconstitutional because it interfered with the judicial process. 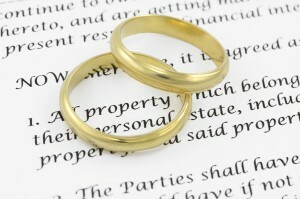 Prenuptial agreements have played an increasingly important role in modern marriages. Indeed with almost 50’000 divorces occurring each year 4, prenuptial agreements can be an important means through which to settle property division. However, these prenuptial agreements in Australia, governed by the Family Law Act, have been controversial. Due to the perceived high level of technicality about how they should be agreed and drafted leading some lawyers to argue that they are “not worth the paper in which they were written” 5. Law firms have historically been very selective about doing pre-nups for because of the risk of being sued and because of the time and expense involved in preparing them. The 2010 amendments sought to reduce the difficulties in preparing pre-nups. The case of Wallace v Stelzer demonstrates that some pre-nups with technical errors can be held valid as a result of these amendments and, furthermore, the effect of these amendments applies to pre-nups prepared before they (the Amendments) were passed. Hence, the case of Wallace has introduced a level of certainty into this area. As a result of Wallace, pre-nups entered into by couples before 2010 can still be considered valid, even if they do not strictly comply with the legislation. Consequently, the fact that the solicitor’s certificate annexed to the agreement was incorrect did not invalidate the financial agreement between the husband and the wife because the 2010 Amendments- deemed valid- relaxed the technical rules and gave the courts a broad discretion.